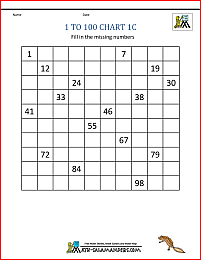 Welcome to the Math Salamanders 1st Grade Math 100 Square Activities (or 1-100 Charts) activities page. Here you will find a range of free printable 1-100 squares, which will help your child learn their numbers from 1 to 100. 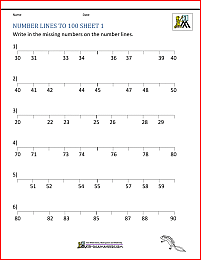 On this webpage you will find our range of basic math fact charts from 1-100. There is a wide range of printable 100 Squares, including larger charts and mini 1-100 charts, blank charts and partially filled charts. 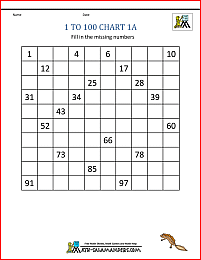 There are many different fun math activities that you can do with your child with a 1-100 chart, please see below for an activity sheet. There are also printable 0-99 charts on a separate webpage. All these free printable charts will help your child learn their numbers to 100. 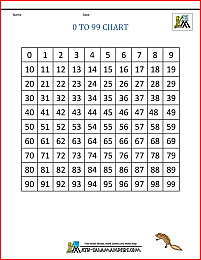 Here you will find a selection of 100 Squares designed to help your child learn their numbers to 100.
understand how to count on and back in tens. 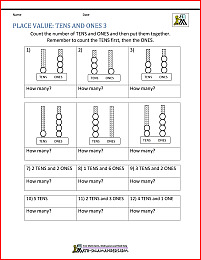 All the free 1st Grade Math Place Value Worksheets in this section follow the Elementary Math Benchmarks for First Grade. Numbers start in the top left hand corner. Numbers start in the bottom left hand corner. 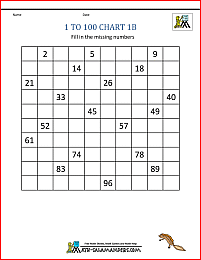 Here you will find some great ideas to use with the 100 Squares. On this webpage you will find our range of basic math fact charts from 0-99. There is a wide range of printable charts, including larger charts and mini 0-99 charts, blank charts and partially filled charts. All the free Math sheets in this section follow the Elementary Math Benchmarks. understand place value to 100. All the free First Grade Math sheets in this section follow the Elementary Math Benchmarks for First Grade.